Relocation of 96 families of Model Town E-Block quarters, allegedly involved in criminal activities, littering various sites and tarnishing the beauty of the society, is still on a bumpy track as Model Town Society (MTS) and Model Town Residents Association are at odds on the issue. The issue has been pending for the last many years despite repeated complaints by the residents of Model Town. In the past, plans to vacate E block quarters from dwellers and to get them settled elsewhere began to materialise, however due to lack of will, status quo remained. Majority of the occupants of the quarters in E block are reportedly involved in various criminal activities. As there is no proper check by the administration, they residents of the block are on the loose to run criminal gangs. So much so, gambling dens are on the rise in the area, while opium and heroine drug-pushing is rampant. Fight incidents have also been reported a number of times in the area. Originally, allotted to 96 families, the quarters are now nestling more than 10,000 people. Many new families have shifted in these quarters after quarter owners expanded their allotted places and rented those. These quarters, each of 1.5 marla, built on 20 kanals area of 3-E, 4-E, 33-E, 34-E plots, were allotted sixty years ago to refugees who came from India after the partition. The land was transferred to the federal government by the owners of the plots 3-E, 4-E, 33-E, 34-E, which was lately allotted to the Housing Department by the federal government. Old built quarters have also decayed over time and due to owners’ negligence. The unplanned construction has put the residents’ lives at risks. Recently, a man died in a roof collapse in one of the multi-story quarters. MTS has planned to exchange these 20 kanals of area with 24 kanals in K Block to address the reservations of the residents of E and D blocks and also to give a safer living place to quarter’s population. MTS President Colonel (r) Tahir Hussain Kardar told Pakistan Today that the relocation plan had been approved by MTS registrar. He claimed that a summary of the relocation had been approved by the Punjab chief minister and a final meeting with the commissioner was left to finalise the matter. He said there were senators and ministers living in the area. 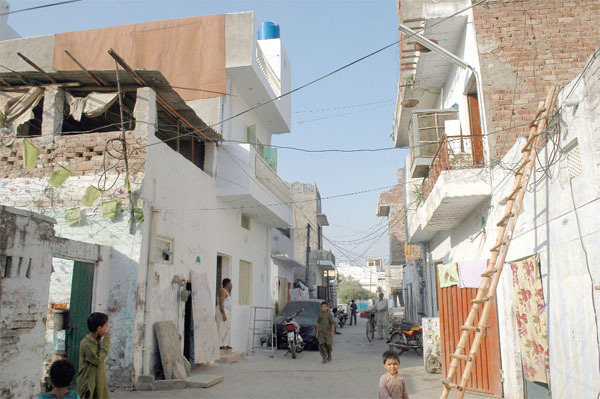 A senior member of Model Town Residents Association, Naila Najam criticised the move and said the actual settlement plan of the town could not be changed according to the by-laws of the society. She said the relocation of the quarters’ settlement to K Block did not comply with the rules as it was declared as a residential area at the time of plots sale to the people and such a move would devalue the property of the people living in K Block. She criticised the society president’s decision and said the members of the society from K Block were not taken on board at time of deciding the shifting plan. She also alleged the society administration for misusing the name of Nawaz Sharif, Hamza Shahbaz and Amir Mehmood. She said society administration had a defective plan because the new area for the shifting did not have electricity, water and sewerage facilities and it would cost more than six crore for providing these facilities. She also claimed that the plan was approved in a meeting with an incomplete quorum. She repeatedly said that she was not against shifting of the quarters but against “defective” plan of the MTS. She said the K Block had been facing discrimination since long and the earlier settlement of Marian also devalued the property in K Block. She asked MTS administration to look after the houses of poor MTS employees who were living in decaying quarters. YOU ARE ALL WRONGE INCLUDING SAIF UR REHMAAN HE IS A CRIMINALSAIF UR REHMAN IS LAIR AND THEIF AND ALSO QABZA MAFIA AND HIS ALL BROTHER ARE GAMBLER.